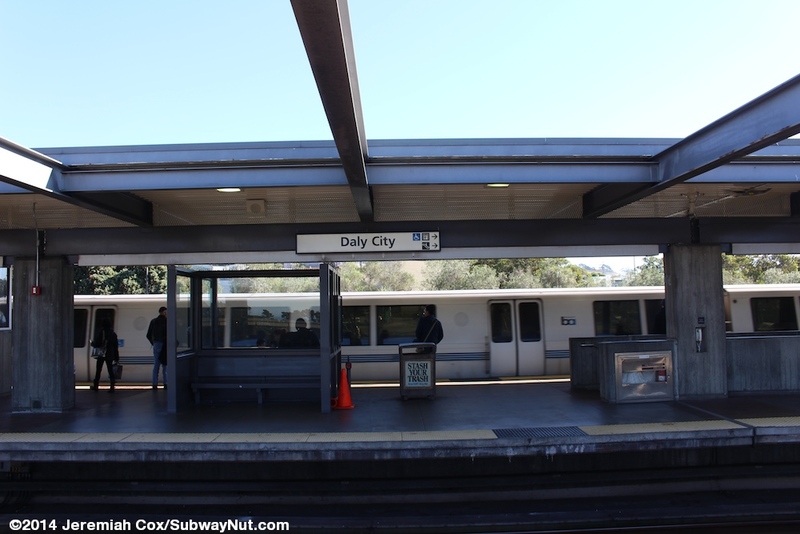 Daly City is the original terminus of the BART System on the San Francisco side of the bay and opened on November 5, 1973. 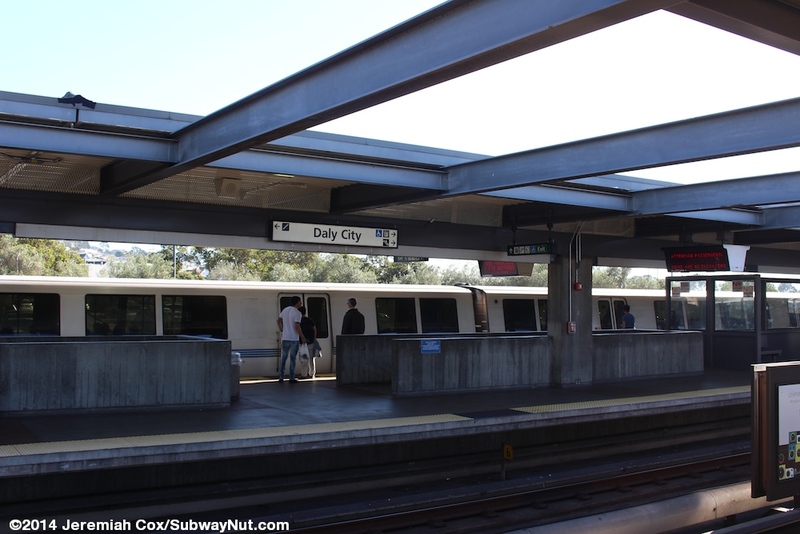 The station is located in the extreme northern side of Daly City just south of the border with San Francisco and was the only stop in San Mateo County for the first 23 years of BART until service was extended one-stop to Colma on February 24, 1996. 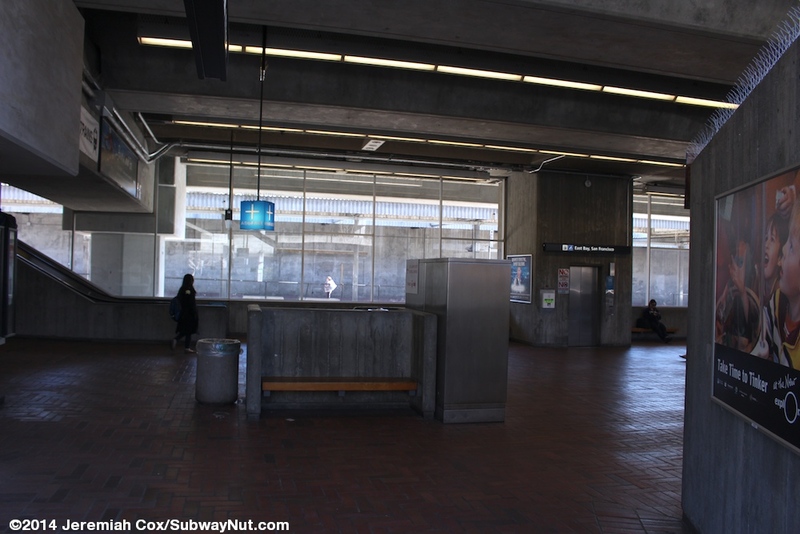 The reason it took BART so long to be extended south was San Mateo County decided to back out of the BART rapid transit district in the late 1960s. 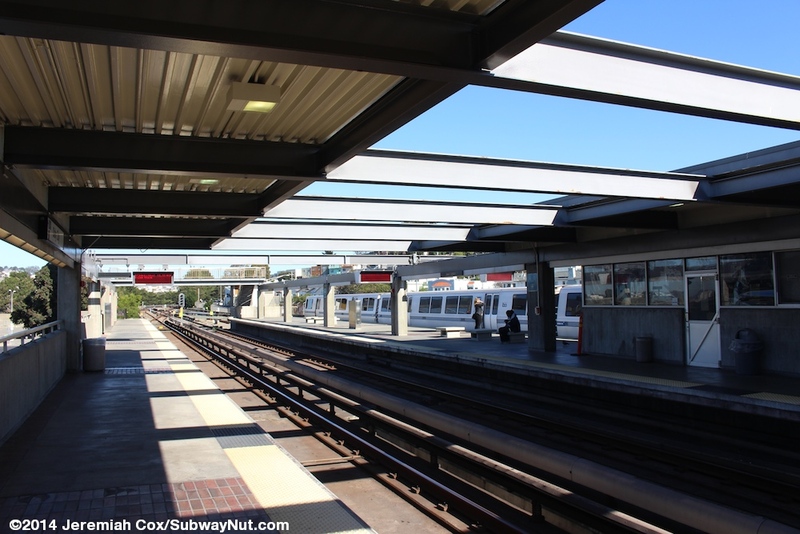 BART was eventually extended south into San Mateo County but service south of the station was built and still operates under a complex contract between BART and SamTrans, the local transit agency. 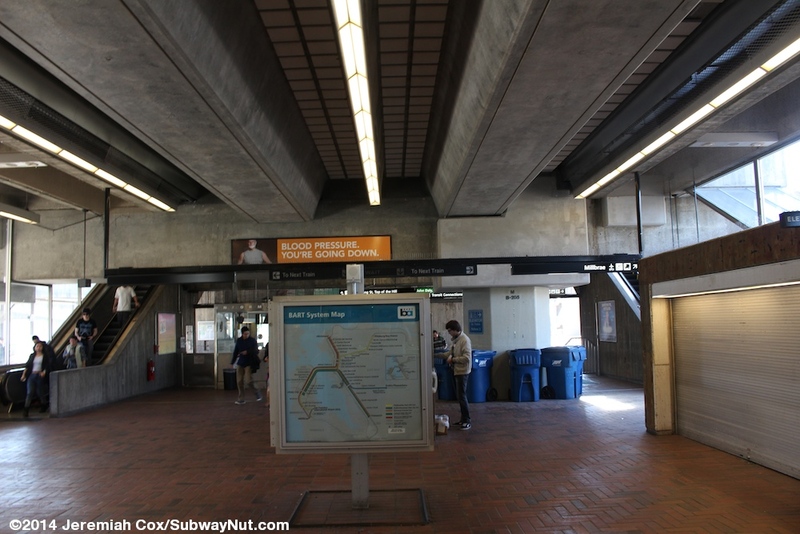 Daly City is still the terminus of most BART service that comes through the East Bay Tube including all trains from Fremont and Dublin/Pleasanton. 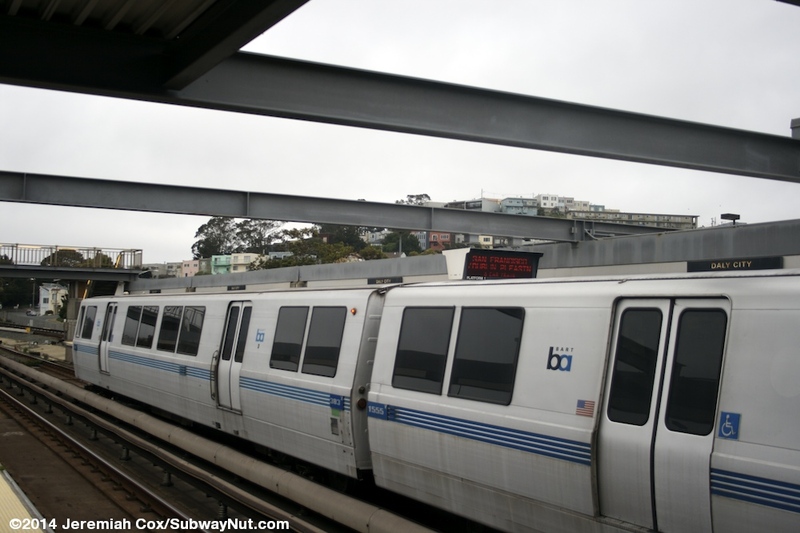 Trains from Pittsburg/Bay Point provide the base of service to the SFO Airport, service running south of here on this line is only the base every 15 minute service (the 15 minute daytime, 20 minutes evenings and weekends frequency is maintained on all other lines at all times). 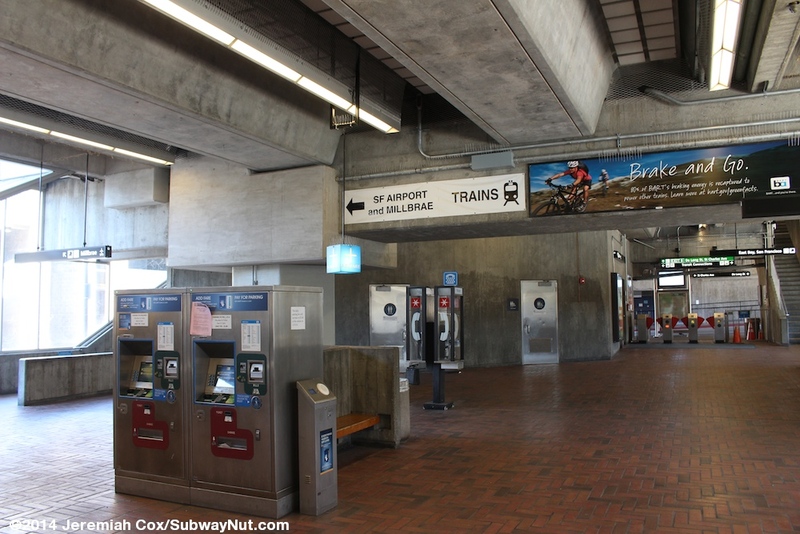 The supplemental service on this line (BART's busiest) that operates during rush hours (often terminating at Concord) terminates here at Daly City, not continuing farther south. 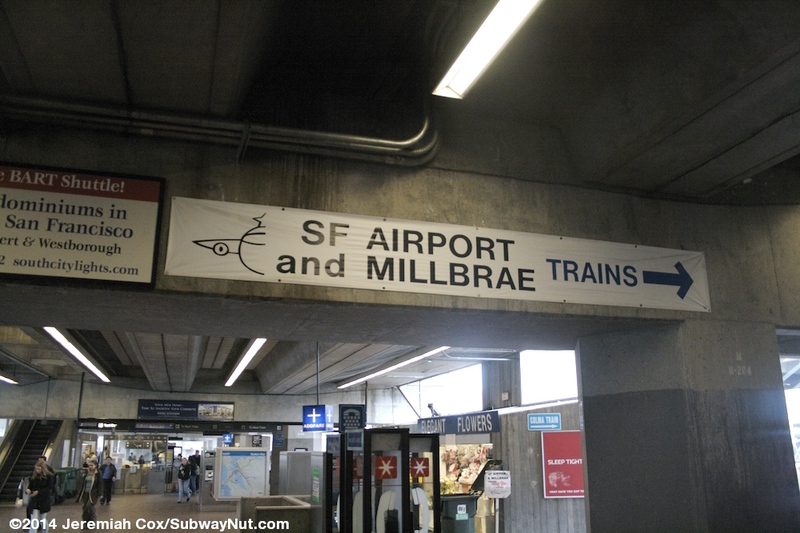 These trains are supplemented by all trains from Richmond to Millbrae only on weekdays until 7:00pm, otherwise those terminate here and Millbrae is served on evenings and weekends by SFO Airport trains changing direction in the SFO Airport station to continue to Millbrae (it results in 3-6 extra minutes of travel time). 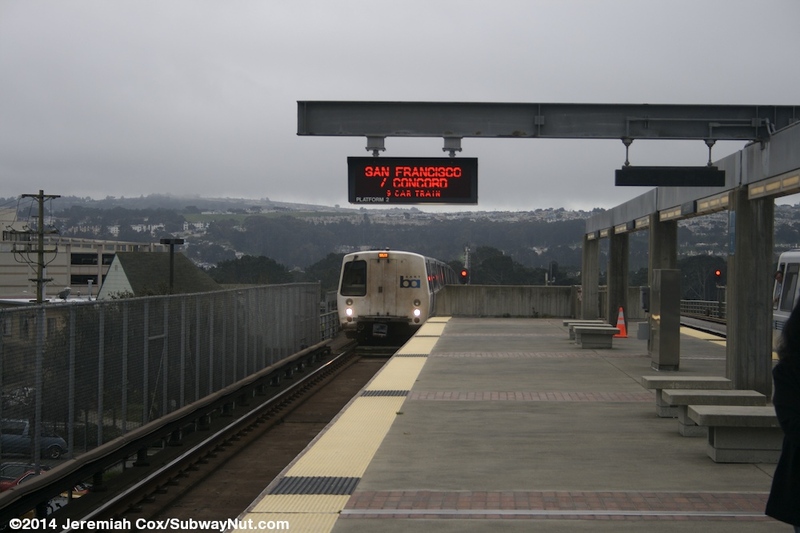 All trains running northbound from this station have San Francisco written as the first destination on their signs followed by the respective East Bay destination. This is the same as the fact all San Francisco-bound in the East Bay say San Francisco/Daly City. 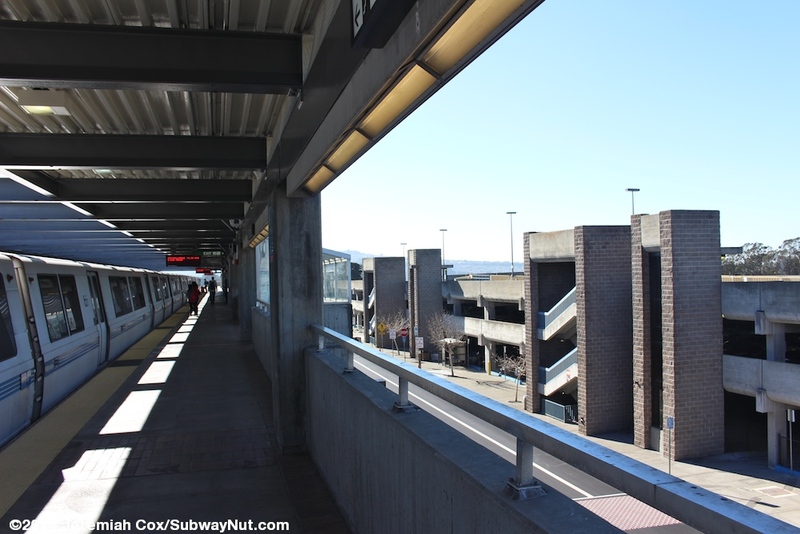 The station is located on an elevated concrete guideway and has three tracks. The tracks join back into two just north of the station, and this is the number of tracks through San Francisco and the transbay tube. 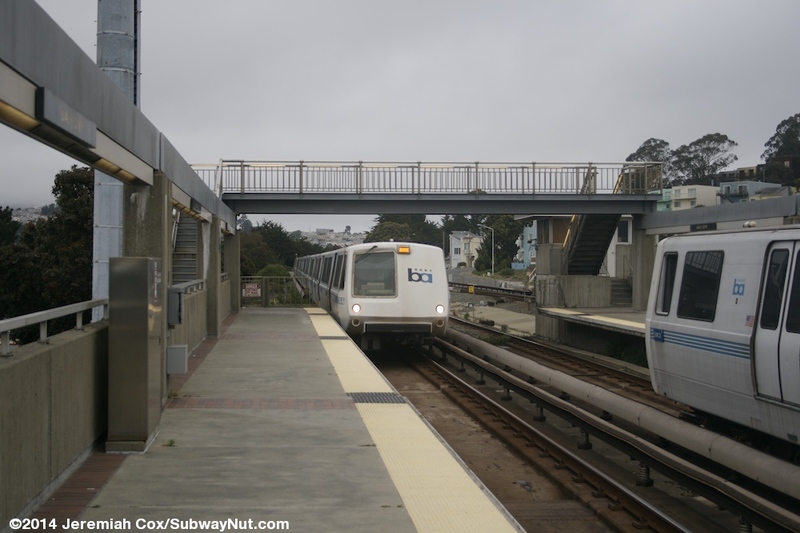 The three tracks though continue south to the next station, Colma since this stop is situated around and at the same location as the Colma BART yard. The platform configuration is a side platform along the western-most track and an island platform along the easternmost two. 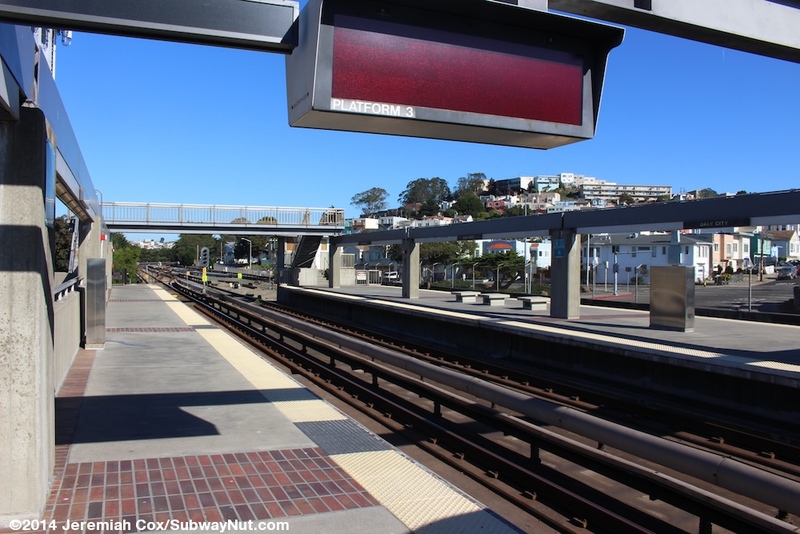 The side platform is used by all southbound trains continuing in service to SFO Airport or Millbrae. Some terminating trains also stop at the platform discharge and run south towards the train yard to reverse. 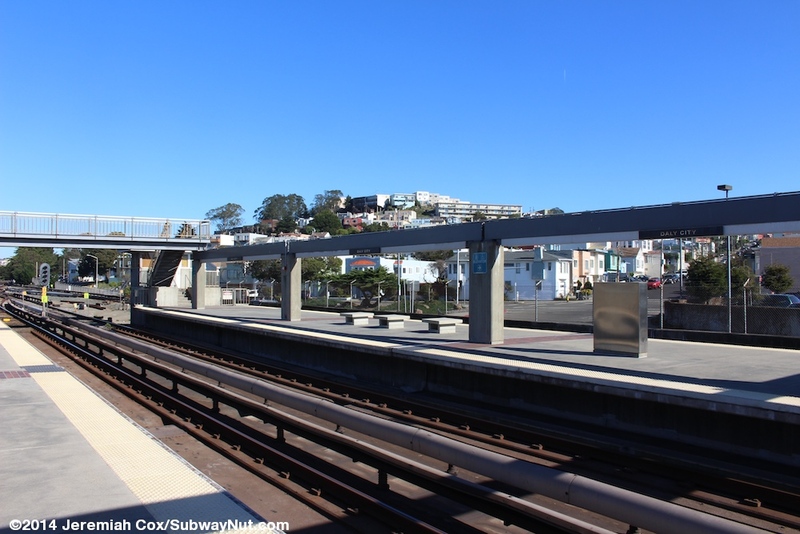 Most terminating trains simply use either of the tracks along the island platform and this platform is also where northbound trains making Daly City as just an intermediate stop, stop. 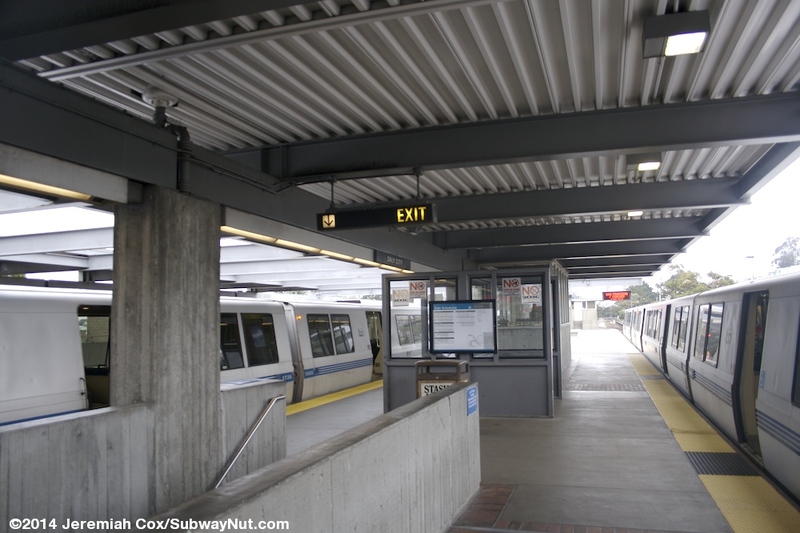 The fact that trains continuing south stop at the side platform and not always the same platform as terminating trains means BART designates Bayfair as the transfer point in the East Bay (although every stop in the city of San Francisco has a single island platform for the two tracked line). The platforms have the normal 1970s concrete design with flat canopies over the middle halves of the platform. The design of this canopy has beams (but not canopies) crossing above the tracks, boxing around trains (except on Platform 2, the outside island platform track). At the northern end of the platforms is a simple footbridge connects the side platform with the island platform and a small office at the end of that platform. Just beneath the canopied portions of the platforms at street level tucked under the canopied portion of the platforms is the station's fare control area. Here two escalators and a staircase lead up to the island platform while just one escalator and staircase go up to the side platform. 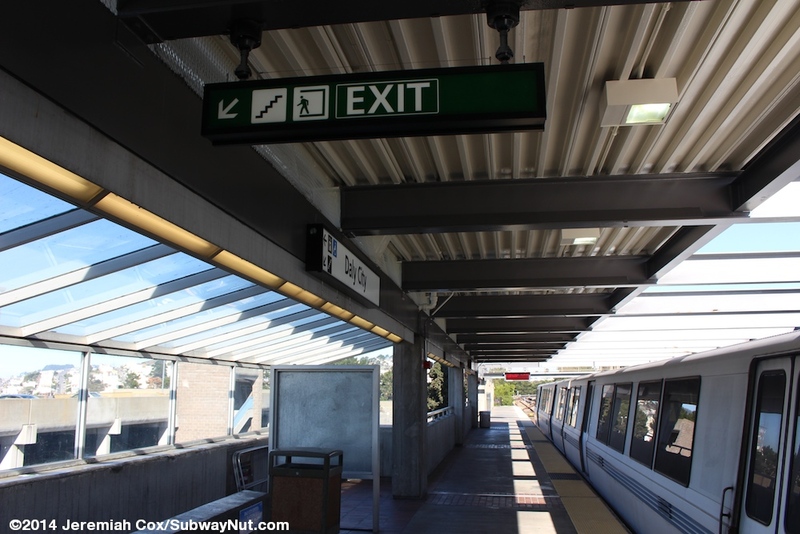 Signage beneath the station is haphazard with some of the modern green (and white station name signs on the platform) an original looking Next train display for directing passengers to the right platform when all trains terminating at Daly City (that has a middle setting 'Wait'). 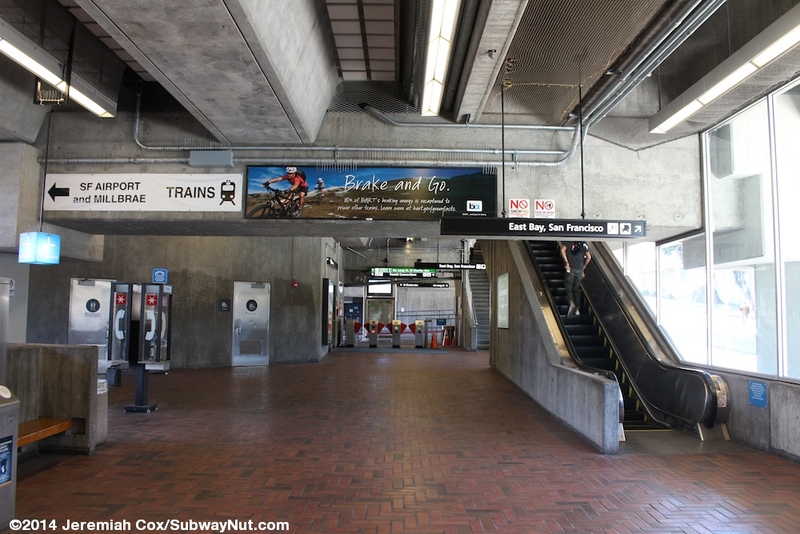 There are also some white with black text and other non-standard issue signs for SF Airport and Millbrae trains to go up to the side platform. The fare control area has fare gates at either end. These lead out to driveways parallel to each side of the tracks. 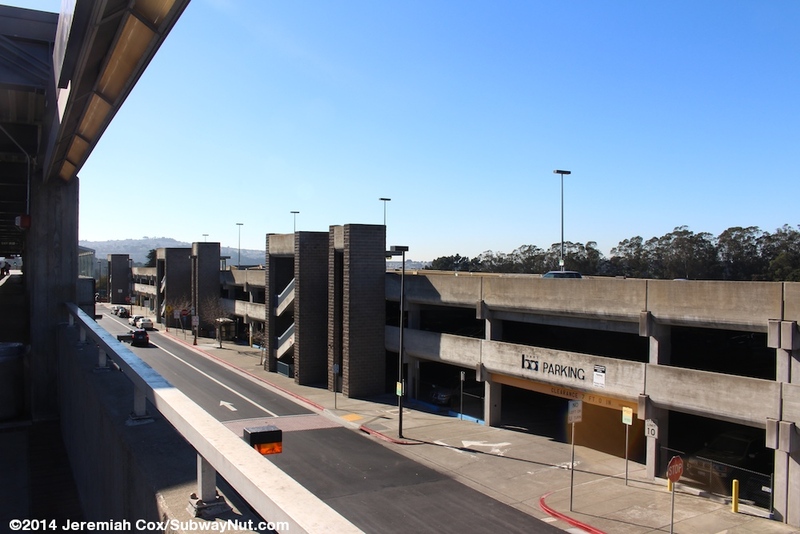 The west driveway is the station's bus loop serving 4 SamTrans Bus Routes (I assume more when this was the only BART station in San Mateo County) and three Muni Metro Bus Routes that enter San Mateo county to terminate coming down from San Francisco. The station is located just north of John Daly Blvd and the driveways are one-way and exited at their southern ends to this street with their entrances from De Long Street (across from the end of Hillcrest drive) that is on the east side parallel to the tracks before curving away. 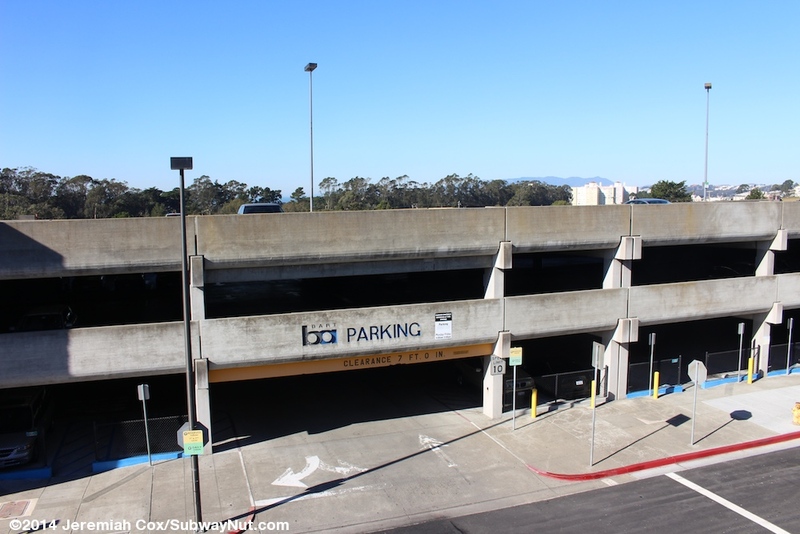 Most parking for the station is in a 4-story concrete with brick accents parking garage that opened on October 10, 1977 this parking garage is along the west side of the tracks between BART and I-280 and has most of the station's 2,068 daily ($2) paid parking spaces. St. Charles Avenue crosses I-280 to the garage along the with driveways along each side of the station. This street also serves two more parking lots, one just north of the garage and another on the opposite side of I-280. 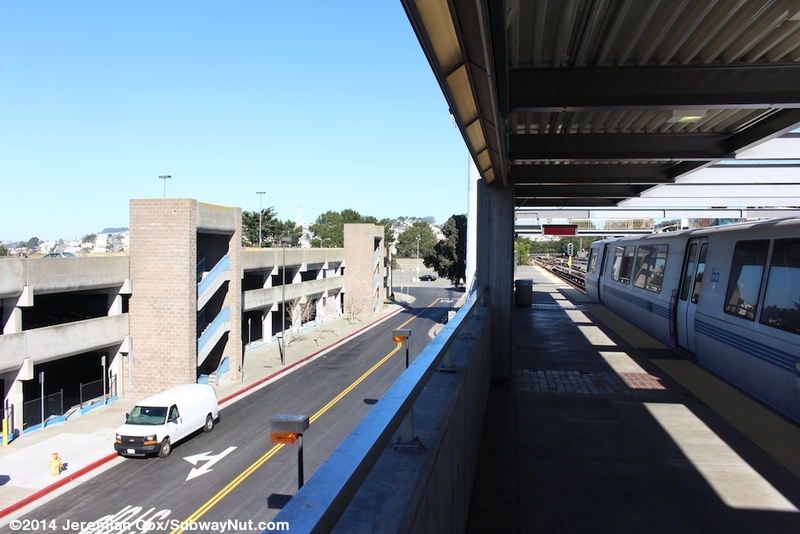 A final parking lot for Midday and Carpool commuters is on the opposite side of the station bounded by John Daly Blvd and De Long Street. This lot has a footbridge across the bus loop to the station.